Nathan MacKinnon didn’t dodge it. In fact, he brought it up himself. 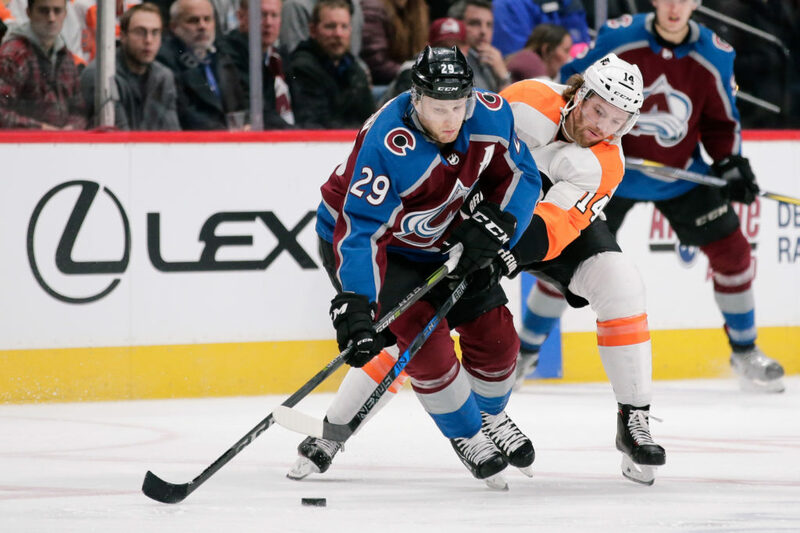 With a playoff spot at stake, the Avalanche’s MacKinnon-centered top line hasn’t gotten a point in the past three games — a 2-1 shootout win over Vegas at home, a 4-1 loss to the Golden Knights on the road and then a 2-1 loss Wednesday night to the Flyers at the Pepsi Center. The Avalanche now has lost three of the last four and by the end of the night still was a point behind the Blues and the Ducks, who sat in the two wild-card spots in the Western Conference. When you’re in the running for the Hart Trophy, as is MacKinnon; and you’re trying to help finish off an amazing regular-season recovery from a nightmarish 48-point season, as is the top line with Gabe Landeskog and Mikko Rantanen on MacKinnon’s wings, the mini-slumps can have monumental consequences. Any small sample size is fair evaluation because of the relentless expectations. The line had 10 shots on goal against the Flyers, but Rantanen especially appeared lost at times, a rarity for him in his second full season with the Avalanche. “We’ve got four goals in the last four games, and that’s not going to win us any hockey games, other than the one in the shootout,” MacKinnon told me. “The last three games, our line doesn’t have a point, and that’s pretty unusual. It was a bizarre night for the Avalanche in the sense that none of the three goaltenders listed on the roster in the press notes printed in the morning — Semyon Varlamov (ill), Jonathan Bernier (infected hand) and Spencer Martin — actually played. With Varlamov stricken, Andrew Hammond got the call to come up from San Antonio, caught a flight out of Austin and played against the Flyers. Varlamov had played in 17 consecutive games. Martin suited up and backed up Hammond, best known for his stingy “Ham-burgular” stretch run with Ottawa in 2015. Since his November inclusion in the Matt Duchene trade, more as a you-gotta-take-him than as a throw-in, Hammond has spent three stints with the Avalanche. He has been out with a concussion for much of March before going to San Antonio, and then finally played his first game for Colorado Wednesday night. “It’s weird not having both your goalies …” MacKinnon began. At that point, I laughed — and apologized for doing so. I asked Avalanche coach Jared Bednar if the top line needed to step up. This shrunk the Avalanche safety net with five games remaining — three of them on the road. The Avalanche most likely will need to win four of the five to be assured of a playoff spot. Now, with the Nuggets on the verge of being ruled out of the NBA postseason, the possibility looms of a fourth consecutive spring without either of Kroenke Sports’ showcase Pepsi Center properties in the playoffs. MacKinnon was a decent guard back home in Haifax, at one point hoping to play both high school basketball and major junior hockey at the same time. But that was ruled out, a pragmatic move considering the impossible-to-miss talent he showed on the ice. Now he can help soften the blow for Kroenke Sports of the Nuggets missing the playoffs with an electric run down the stretch. I still think the Avalanche will get there. But the road got tougher. Terry Frei writes two commentaries a week for Mile High Sports. He has been named a state’s sports writer of the year seven times, four times in Colorado (including for 2016) and three times in Oregon. He’s the author of seven books, including “March 1939: Before the Madness,” about the first NCAA basketball tournament and its champions; and “Horns, Hogs, and Nixon Coming,” about the landmark 1969 Texas-Arkansas football game and the events swirling around it. His web site is terryfrei.com and his additional “On the Colorado Scene” commentaries are at terryfrei/oncolorado.